The Sueddeutsche Zeitung has reported the names of three cities in Syria which are near sites suspected of being functionally related to a destroyed covert reactor construction project. 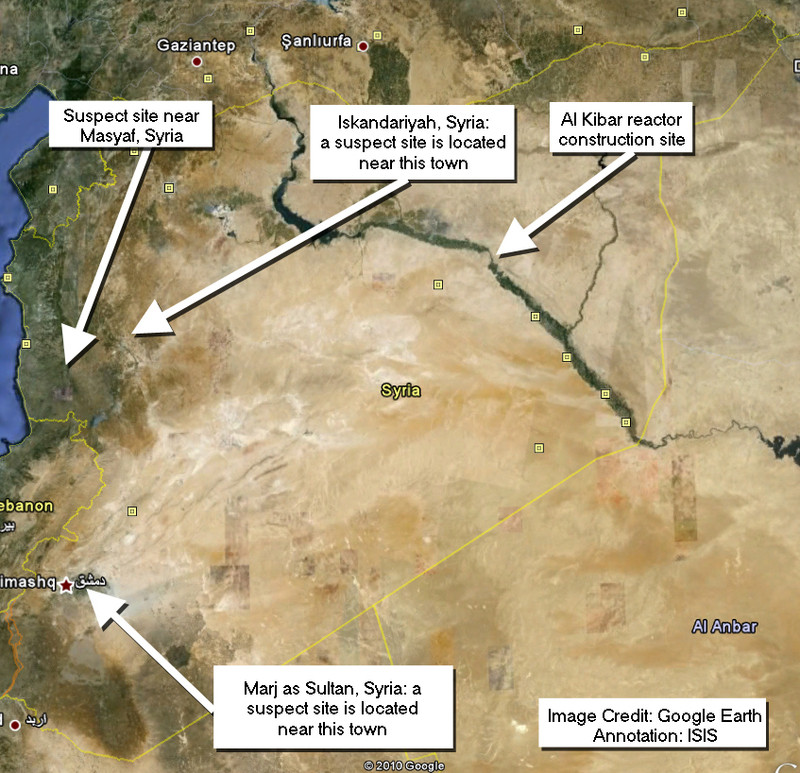 These suspect sites are located near Masyaf, the village of Marj as-Sultan near Damascus, and Iskandariyah (see figure 1). ISIS has learned that the site seen in Figure 2 is the suspect site located near Masyaf. This site is located approximately six kilometers northeast of Masyaf city center 1 in Syria (see figures 3 and 4), and appears to be comprised of storage buildings. 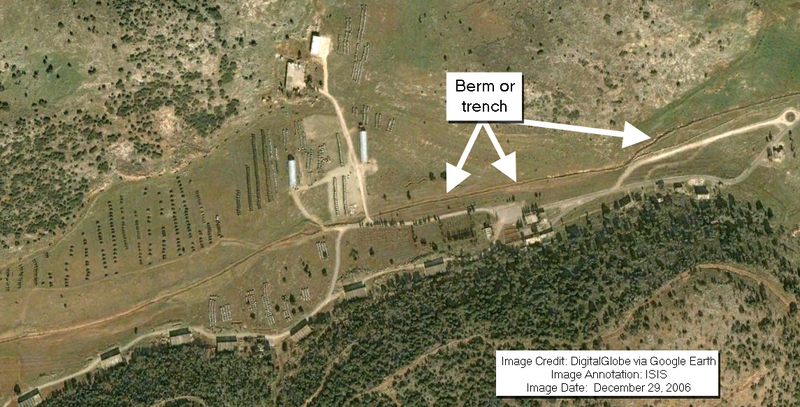 Aside from what could be a line of berms or trenches (see figure 5), the site does not appear to have many security measures visible in commercial satellite imagery. The entire site, however, is situated in a ravine between two hills and buildings at the site are located along the base of the hills—a common method for providing general protection and isolation. 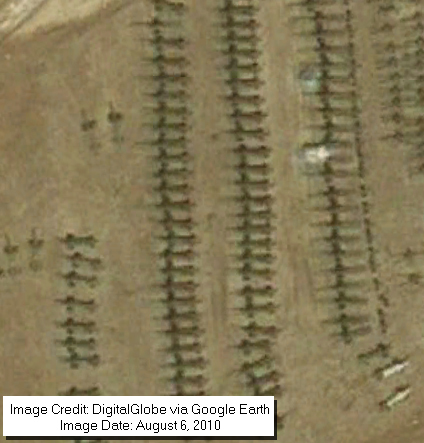 This could indicate that the site is a military depot/storage facility. Hundreds of items can also be seen stored in rows out in the open (see figures 6 and 7). It is unclear what these items are. Syria was secretly building a reactor in the Dair Alzour region along the Euphrates River with assistance from North Korean trading companies. After acquiring incriminating ground photographs taken inside the reactor building, Israeli jets bombed the facility in a pre-dawn raid in September of 2007. In April of 2008, member states provided information on the reactor project to the International Atomic Energy Agency (IAEA) as well as the locations of three other sites in Syria suspected of being functionally related to the reactor. ISIS has learned that there is an additional site that the IAEA is interested in visiting, bringing the total to four sites. 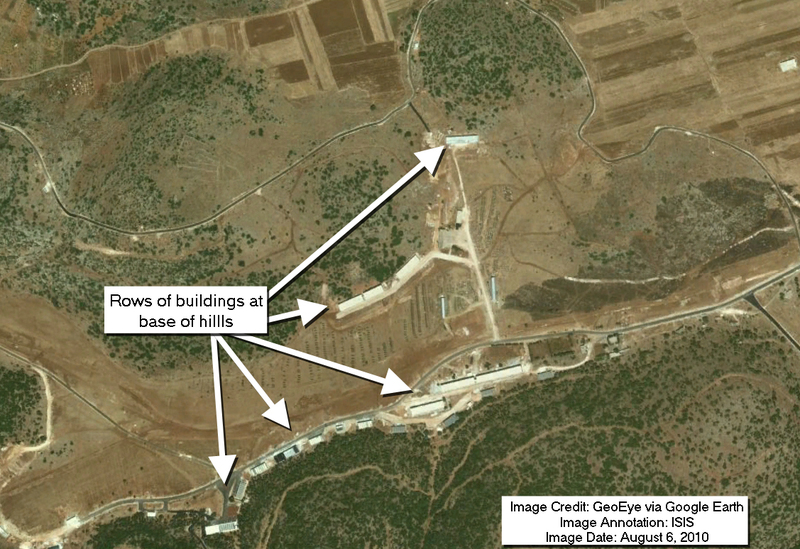 The IAEA has repeatedly asked Syria for access to these sites, but Syria has so far refused. ISIS learned during the April 2008 briefings by US government officials that some U.S. intelligence information indicated that one of the suspect sites might be related to uranium processing. These sites could also have served as storage facilities for equipment or materials, such as graphite, en route to the Al Kibar reactor construction site. A senior official close to the IAEA said in an interview on November 16, 2009 that the IAEA had received information that showed that equipment was seen coming and going between the reactor and these three sites. Furthermore, one of these sites could have been used as a means to store uranium intended for the reactor. It is unclear if these sites also include ones where Syria is suspected of storing portions of the bombed reactor building resulting from the Israeli airstrike. The IAEA has for over two years requested from Syria access to these sites suspected of being related the Al Kibar site. Syria has refused to cooperate with the IAEA, and it continues to dodge the IAEA’s questions. It Syria continues not to cooperate beyond the upcoming Board of Governors meeting, the Director General should call for a special inspection in Syria. Figure 1. 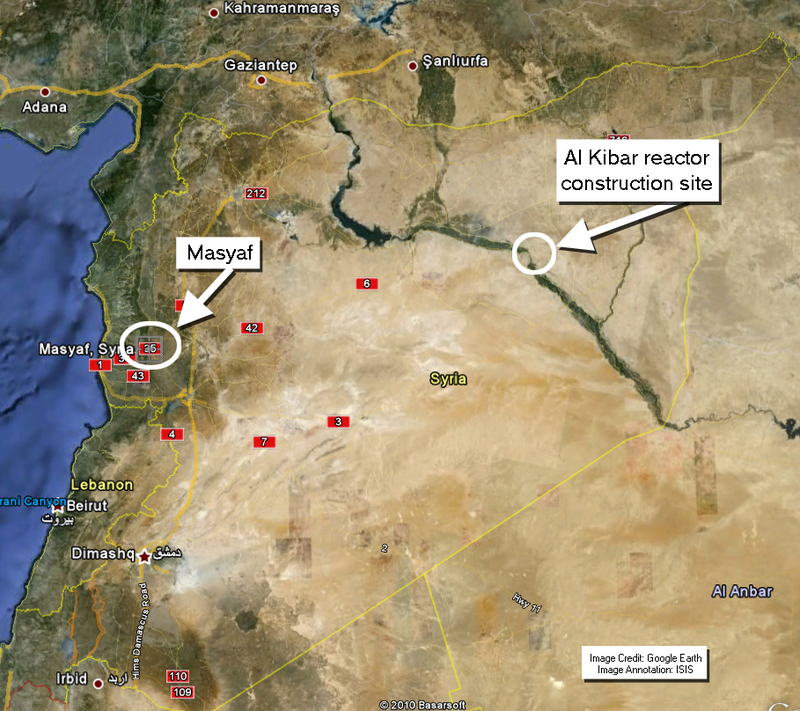 An overview of Syria, the location of the Al Kibar reactor construction site, and the cities near sites suspected of being functionally related to the Al Kibar reactor. Figure 2. An overview of the site near Masyaf. Rows of buildings can be seen at the base of the hills. Figure 3. Wide view of Syria showing site of Al Kibar reactor construction and Masyaf. Figure 4. Closer view of Masyaf city, and the location of the suspect site. 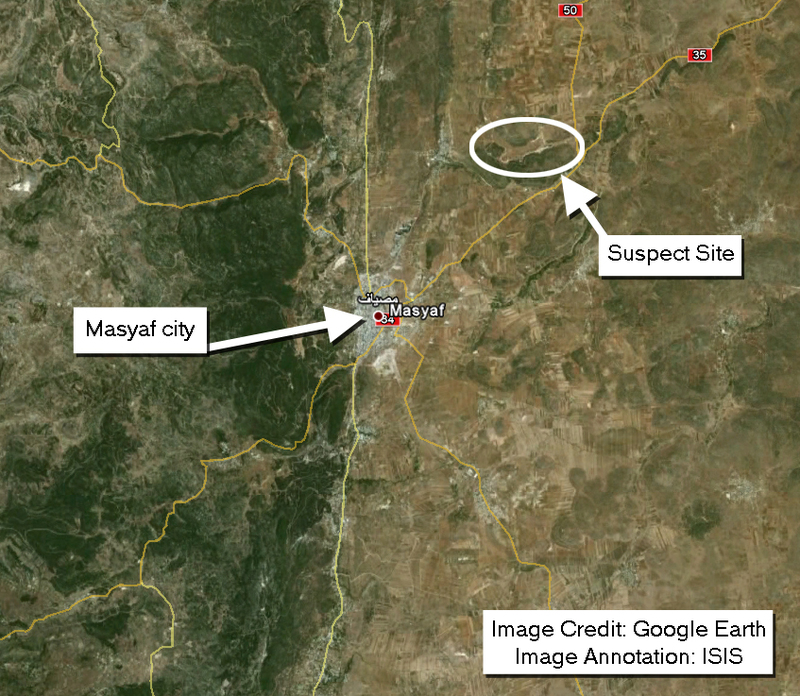 The suspect site is approximately 6 kilometers away from Masyaf city center. Figure 5. 2006 commercial satellite image of the site near Masyaf. A line of berms or trenches can be seen. Berms and trenches are often used as a security barrier for sensitive sites. Figure 6. Closer view of suspect site near Masyaf. Rows of items are stored outside. It is unclear what these items are. Figure 7. 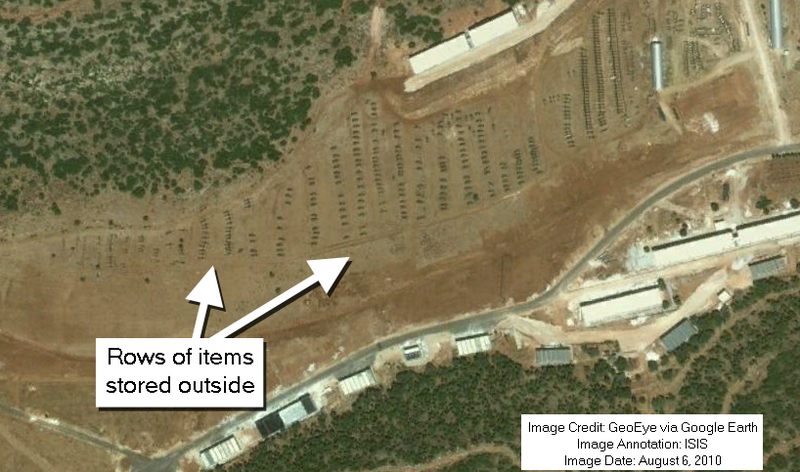 A close up satellite image of the rows of items stored outside at the site. It is unclear what these items are.